All across central Missouri, transmissions make cars and trucks go. They transfer the energy of the engine to the drive shaft to power your car forward (and backwards, for that matter). Regardless of if your car’s transmission is an automatic or a manual – or a front, four-wheel or all-wheel drive – if you’ve got transmission problems, it won’t be long before you’re going nowhere. At Sedalia’s Bryant Motors, our service department, staffed with ASE-trained technicians, can help you with your vehicle’s transmission needs, whether it’s routine maintenance, repair or replacement. Located conveniently on US-65, our transmission mechanics can service cars, trucks, minivans, and SUVs of any make and model! Call (800) 886-2701, contact us or stop by today. 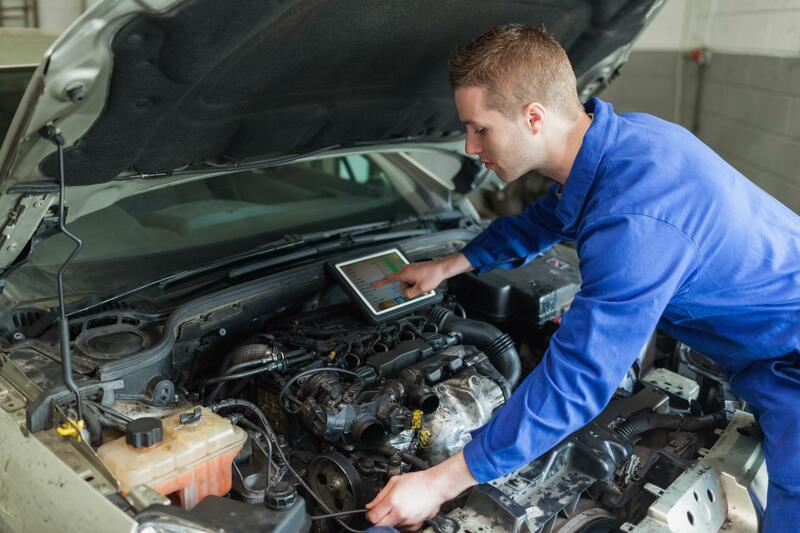 At Bryant Motors, our ASE-trained technicians can perform service, diagnostics and repairs on a transmission of any make and model of car or truck. Beyond transmission repairs, we can also provide low-cost schedule maintenance checks, A/C repair and full service oil changes. Regardless of if you drive a Chrysler, Dodge, Jeep or other vehicle make, our skilled and friendly service department is here for drivers from Warrensburg to Jefferson City and across Central Missouri. Browse our online resources for car maintenance and repair tips or visit our Car Buying Guide for advice when shopping for your next car. Taking in your vehicle right when you notice these problems can help increase the chances that your car will only need minor repairs instead of a serious transmission rebuild. Flushes: Depending on the year, make and model of your vehicle, as well as if the transmission is manual or automatic, you may occasionally need a transmission flush. A flush involves draining the current transmission fluid and replacing it with new fluid. The mileage at which this service is needed can vary greatly – from every 20,000 miles to never. Trucks that pull heavy loads or use specialized equipment like plows may need a flush more frequently. It’s important for you to refer to your owner’s manual to learn how frequently the transmission fluid needs to be replaced and to talk to your auto technician if you think your fluid may need flushing more frequently. Leaks: If you spot a puddle under your car, it’s important to take it in to make sure the transmission isn’t leaking. Your car requires transmission fluid to operate; if it’s leaking out, it can cause serious wear and tear to the car that could end up leading to an expensive rebuild or replacement. At Bryant Motors, we can diagnose and fix troublesome transmission leaks before they quickly turn into much bigger, costlier problems. Repairs: Sometimes your transmission may need more than just sealing up a leak; it may need repairs to the solenoids – parts within the transmission that control the amount of fluid surrounding and in the transmission. This can be an intensive repair, so your technician may recommend having all the solenoids replaced at the same time in order to avoid another solenoid replacement in the near future. Replacement: The last thing a car, truck or SUV owner wants to hear is that their transmission is gone, blown, or generally just obliterated. If that’s the case, you’re in for a transmission rebuild or replacement. You’ll need to talk to your technician about your best options.